If you crossed Calvin & Hobbes with Lord of the Rings, it's very likely that the result would be Sabretooth Dan! 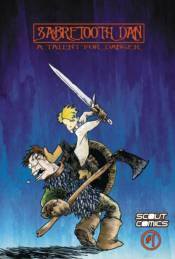 Check out the sword and sorcery comic that stars an orphan with both sabreteeth and an over-active imagination in a LOTR-like world! But when real-world adventure comes knocking, Dan finds it impossible to say no! With breathtaking art, Sabretooth Dan is destined to be an all-ages hit for generations to come!